When it comes to chalk art, Chelsey has been doing it professionally for over 11 years. 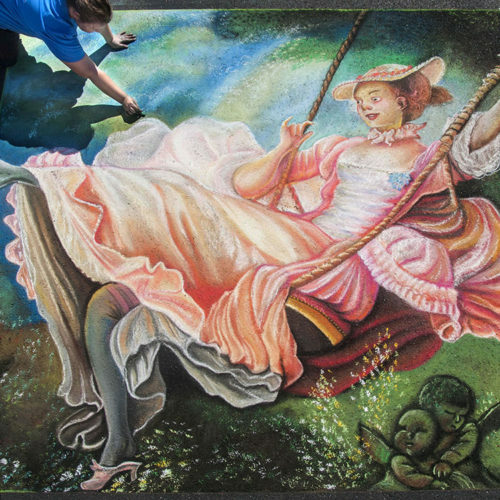 She became an Atlanta local last year and is a member of both the Georgia Chalk Artist Guild & Florida Chalk Artist Association. This street art love story began back in 2005 when her high school hosted it’s own event and introduced the students to a whole new world, inspiring them to create work they didn’t know was possible. In 2015 Chelsey was certified as a Master Street Artist by the FCAA. She has traveled all over the country creating large pieces as a featured artist as well as consulting for events, judging artwork, & leading workshops. Her goal is to go to as many places as possible inspiring different community’s and working with other artists.